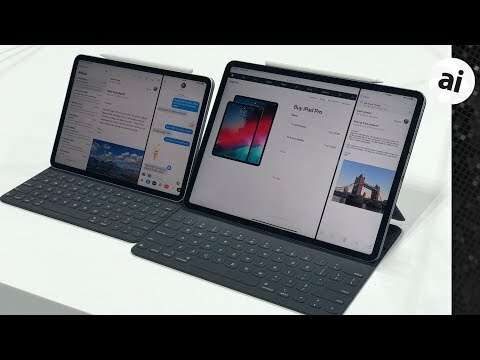 The A12X system-on-chip used in the new iPad Pro is extremely powerful courtesy of a few design decisions taken by Apple in its creation, a walkthrough of the new chip with Apple's Phil Schiller reveals, with one performance-enhancing example being the ability to run all eight processor cores simultaneously. During the launch of the 2018 iPad Pro range, Apple advised the included A12X Bionic is a major improvement on previous models, consisting of an 8-core processor that provides up to 35 percent more performance for single-core loads, and 90-percent more for multi-core tasks. It also boasted about the Apple-designed graphics processing, consisting of a 7-core GPU, one which was claimed to be the equivalent an Xbox One S.
Speaking to Ars Technica, Apple Senior Vice President of Marketing Phil Schiller and Hardware Technologies employee Anand Shimpi explained how the processor was designed to provide so much performance. While it is a close relation to the A12 used in the iPhone XS, XS Max, and iPhone XR, Apple tweaked the chip to make it even more powerful. The first main change for the A12X, produced with a 7-nanometer process, is that Apple allows for all of its CPU cores to run simultaneously. While it has four high-performance cores and four efficiency cores, with each intended for different tasks, most processors using this design style only allow a limited number of the cores to actually run at any one time, whereas Apple decided against this sort of limitation when making its custom-designed performance controller. Benchmark tests performed on the hardware showed the 2018 iPad Pro to have performance at a par with some Mac desktops under Geekbench 4's single-core and multi-core trials. While it lags behind the 2018 MacBook Pro and 2017 iMac Pro, with a 2.9GHz Core i9 and 3GHx Xeon W processor respectively, in multi-core benchmarking, there is far less of a difference under single-core loads. "You typically only see this kind of performance in bigger machines - bigger machines with fans," claimed Shimpi. "You can deliver it in this 5.9-millimeter thin iPad Pro because we've build such a good, such a very efficient architecture. On the GPU side, it is revealed this is Apple's first 7-core implementation of its own custom-designed GPU. Shimpi advised each core in the A12X is "both faster and more efficient" than in the A10X, accounting for the doubling of graphics performance. The performance gains over the A12 are put down to an increase in memory bandwidth despite using a similar implementation, with the A12X having "twice as big of a memory subsystem," according to Shimpi. The Neural Engine was capable of performing 600 billion operations per second in the A11, while in the A12 this figure has increased to 5 trillion per second. In the new iPad Pros, the A12X Neural Engine has eight cores, but Apple declined to advise further about the architecture, except that it was not adapted from the GPU's design. Apple's decision to push forward with its own chip designs is not down to Apple looking to compete with its competitors, Schiller suggests, with the company only focusing on its own work. "The competition can do whatever they're going to do. We're trying our things the best way we know how," the marketing chief said before suggesting "We're judging ourselves on ourselves." "It becomes this incredibly self-perpetuating thing. When you realize you can create a Neural Engine, you want to create a better Neural Engine," Schiller declared. "You realize you can create great graphics, you want to create even better graphics! And it just accelerates. It picks up speed within the organization." Schiller also notes the team's passion to produce better A-series chips year-on-year, with employees taking the responsibility and constantly improving the hardware they are passionate about producing. "We don't care if they're doing something that isn't interesting to us," Schiller continued on Apple's rivals. "We don't care if we're lapping them. Good. We'll lap them ten times. It doesn't matter because it's in service to the user, not the competition." While Schiller avoided discussing the company's future plans, such as rumors of Apple shifting to its own design of chips for desktop Macs and MacBooks, but did offer some insight into how the teams work, noting the process of developing each chip takes place over multiple years. "The chip team will be literally a detective on the other team, saying 'OK, we're planning, we really want more insight," Schiller advises, with the chip team employees researching how other teams want the chip to function, what bottlenecks there are, and when it could start creating the custom silicon for their needs. "Those meetings happen multiple times a week. It's not like there's some big get together, once a year, just to align schedules. They literally are having these discussions weekly about - more and more - a growing number of topics. It's not a finite set. It's a growing number," adds Schiller. The processor improvement of Apple’s A series chips, over the last decade, is mind boggling. It's nice to hear from Anand Shimpi again. Or what they could achieve with Apple silicon (not an A-series chip) that was designed to support a larger and faster CPU and GPU, and had support for 16–128 GiB RAM (although I wonder with the new Mac mini if they'll be move to more slotted RAM with other Macs going forward, not just desktops). Given the way Apple's teams work together to design software and processors/GPUs, it does beg the question [again] as to what it would take for the same focus to power Macs with Apple-designed chipsets. Apple publicly says "no way" but the issue has to be there. Just the cost savings alone, not to mention overcoming technical limitations (Intel's LPDDR4 support history), for 20 million Macs per year could warrant the project. 1) Has Apple made any public statement, much less one where they said "no way' about using even more Apple silicon in a Mac? 2) If they made the 1 TiB iPad Pro with 6 GiB RAM while all the other iPad Pro capacities only have 4 GiB, I imaging that the extra effort to design and build a new chip for Macs doesn't as many unit sales as I'd have expected. They do? I thought they were just avoiding the question. I think there’s a typo or two in your second point. I don’t get it. Apple publicly says "no way" but the issue has to be there. Um, no they haven't. What they've said is that they're not going to merge macOS and iOS -- completely different. It's pretty obvious to everyone that at some point some Macs are going to run on Apple-designed silicon, and the sooner the better given Intel's "I've fallen and I can't get up" performance the last few years. Frankly I think we might see an ARM-based MacBook as early as next year, 2020 at the latest. The performance is already there. Apple is well known to have skunkworks projects that run macOS (and probably iOS) on other processors -- they learned that lesson the hard way from Motorola, and indeed that's how OS X saved Apple. And they will offer Macs with ARM or Intel for some time. There are a lot of reasons to keep Intel based Macs around for a while longer. Seems a good plan would be to ease Intel out the door slowly, or maybe not at all. I think there is little point in keeping Intel around if they can offer the same performance in the machines. The problem will be the folk who need to run Windows on their Macs. Maybe an optional co-processor, or emulation? Interesting he compared the performance to an XBox One X. If you could run Steam on the iPad, all that graphics and CPU power would go to good use as there would be a large library of AAA games you could play. Of course you can't run Steam because iOS is a walled garden so most of that performance will go to waste. Apple would never be able to strike a deal with Steam because Apple requires 30% of the sales revenue and that is more than Steam charges its developers.